We all love to travel, but sometimes trips can be a little pricey. That is why you are spending a lot of time planning your trip and figuring out how to get a perfect vacation without breaking the bank. You are searching for the perfect offer over and over again and you remain unsatisfied. Special for you we have an amazing feature to save your time and money. With Fare Alert you can get the best deals for airline tickets directly to your E-mail. When you will activate this feature you will be receiving a daily update about the best offers for your particular destination. Start Getting the “Best Deal of The Day” Now! You can activate your first Fare Alert in few simple steps. First of all, you need to start a search on TravelPapa.com. To do this, go to the main page and specify your departure airport and your destination. You can get Fare Alerts for a one-way flight, for a round trip or for a multi-city flight. Enter your departure date, and choose a return date if you need to. Also you can select “FLEXIBLE DATES” option and you can specify the comfort class for your flight. When you’re done, you can click the “SEARCH” button. On the search results page notice a “FARE ALERT” button in the upper left corner. By clicking this button, you will open a popup window. Select “I WANT THE BEST DEAL OF THE DAY” to receive the best offer for the chosen destination every day. Select “I WANT THE PRICE LOWER THAN $...” to get notified when there is a deal with the price lower than you entered here. 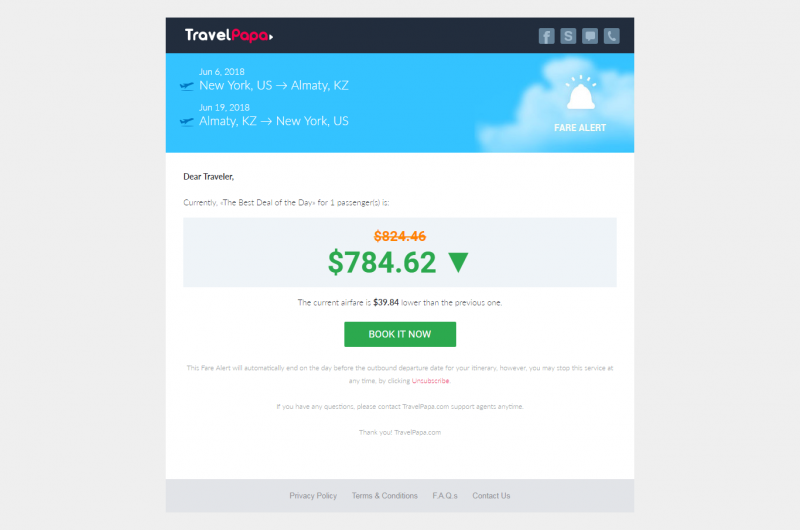 Then enter your best e-mail address to be the first one to find out about the best offers from TravelPapa. After you click "CREATE" you will be notified daily about the best airline deals to your destination. With Fare Alert you won't miss any great deals from TravelPapa. Try this awesome feature now and feel free to contact us if you have any questions!